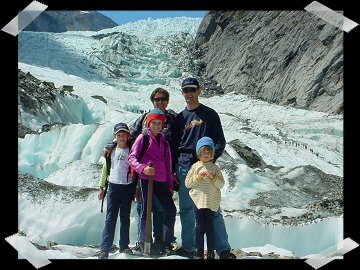 The Schmidt Files.. a short history..
Marc and I met in 1985 through working on Dept of Sport & Rec vacation camps... or rather, attending instructor training camps, in particular the famously dirt-cheap Snow camp training weekend. Marc was a veteran of the under canvas camps; I was a newcomer (but had joined the abseiling club at college) and so the whole outdoorsy thing was the background for some sort of mutual attraction. 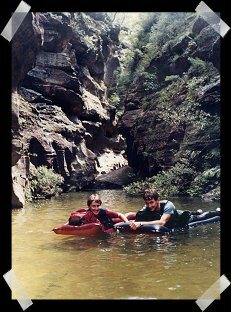 I leapt at an invitation to do a 3 day bushwalk with him and some other friends of his, and I also committed myself to landcrewing for him in a couple of canoe marathons. 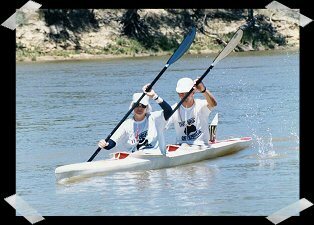 By the time the marathons came about, we'd become "an item", and after landcrewing for him in the Murray Marathon (400 km over 5 days), I insanely decided I'd rather be in on the action and getting some attention as well. I have no idea why, as I had never really physically pushed myself to the limits before. Perhaps it was finally connecting with people who got their kicks from adrenalin in the great outdoors, rather than with alcohol in smoky pubs or clubs. We bought a double TK2 kayak, conned others into landcrewing for both of us.. and the rest, as they say, is history. We ended up doing both the Hawkesbury Classic (111km), and the Murray Marathon a few times together, (buying a secondhand K2 as well) and then doing the NSW state marathon series races. Meanwhile over that first summer, I did my first canyon.. and loved it.. and so canyoning was the usual summer weekend activity when we weren't canoeing. Winter brought cross country skiing (and the downhill skis were relegated to the shed.) 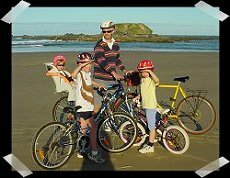 Mountain bikes and panniers were acquired, and a couple of bike trips completed, as well as the odd spot of normal bushwalking. Rafting was another project, and after buying our own gear, and doing a practice run on the Nymboida River, the grand plan of rafting the Franklin River in Tassie came to fruition with a group of friends in early 1989. After 3 1/2 years we finally got married (in '89)- figuring that if we could cope with the trials and tribulations of 400km in a kayak together, we should succeed at this marriage marathon lark!! See those couples doing the marathons at 60 and 70 years old.. we were going to grow old together doing stuff like that. 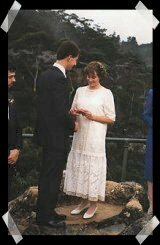 Appropriately enough we had the ceremony on a lookout in the Blue Mountains; I moved to the Southern Highlands where Marc had been based for a year, and then we started owner-building a house. We also acquired ourselves two puppies before we had kids. Rags and Rattles - stumpy tail cattle dogs (and sisters from the same litter) were always part of the family. 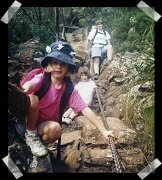 For the kids they'd just always been there, and planning holidays always involved figuring out where to leave 'Double Trouble'. Before the babies arrived, we'd already dubbed them 'The Girls - so having three of the human variety who, surprise, surprise, were also referred to as 'The Girls' made for some confusion at times. 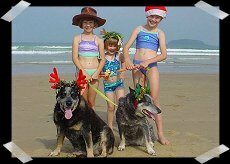 They both lived to pretty ripe old ages - doggie-wise - Rattles succumbing at 13 years, and Rags just before she turned 15 in the October school holidays at the end of last year. We haven't made any plans for more pets just now, with plans for spontaneous (and otherwise) camping and bike riding trips. I guess I have a tendency to define myself by my recreational interests, rather than work, but our outdoor pursuits have been the foundation of our lives together. We have managed to do a bit with the girls... although perhaps not to the extent that we might have imagined we would. Marc's work commitments have had a bit to do with that.. 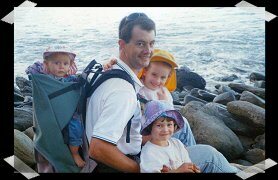 So I suppose no personal history is complete without a work or career resumé..
Marc did a year of Engineering, then dumped that for a traineeship with the (then) Sydney Water Board as a Hydrographer. He worked his way up the 'tree' there, then our move in '97 was in effect deserting a sinking ship for a private company that works in the field of 'environmental monitoring'. This involves everything from digging ditches and dangling current meters in sewers, to the sophistication of sending hydrographic data via radio telemetry or satellite. Unfortunately this job involves way too much overseas work (mainly Asia), and even most of the domestic work involves travelling away. It was always promised that they would employ more people as they got bigger to reduce the amount of travelling .. but it just hasn't panned out that way. They have employed more people, but they then have to tender for more jobs, and everyone still travels away too much. We are thus locked into a vicious cycle of me not being prepared to try and work as well as being 'there' for the kids while he might be away for weeks at a time. We find the notion of moving quite difficult with the needs of the kids, and the support networks you gradually develop in a community, to think about. For now my job is CEO Domestic Affairs. I am recreation coordinator, taxi driver and, lately, a less than enthusiastic cook and housemaid. Nearly half the time I have to be Mum and Dad. I dream up holidays (to make up for his absences), and seem to have a job as official family scribe and webmaster. (He keeps hassling me to update the website and holiday reports.) I have done some voluntary stuff at the primary school in the past, but this year I'm sticking with just being Secretary and Webmaster with the kids' netball club. And waiting for some amazing, flexible, work-from-home job to land in my lap!